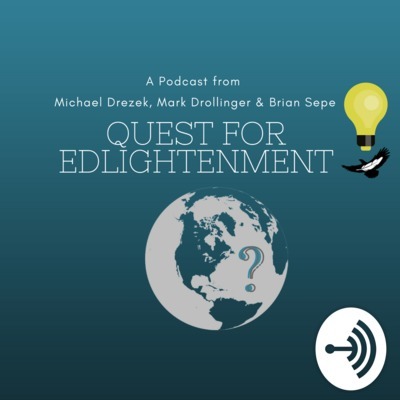 This is Quest for Edlightenment, a podcast from educators Michael Drezek, Mark Drollinger and Brian Sepe. On the Quest, we'll bring about questions, ideas, and inspiration for the classroom and beyond. This is a chance for educators and learners from across the globe to share their story with the world with the aim of making it a better place! On this quest, Alex Andreoli from The Imaginarium at i-Square in Irondequoit, New York, gives us an inside look at the future of sustainability, art, and technology. When I now think of preparing our students for a world in 2030, I now think of this space. During my visit, I saw kids of all different ages playing, exploring, and learning. So much of what goes on inside Imaginarium connects to making our world a better place. Hear how Alex's journey in education led him here and gain some new perspectives on how we all play a part in bringing an Imaginarium mindset to the classroom for today's students. Take a look inside for yourself at https://imaginarium.i-square.us/. On this quest, we sat down with Dr. Darlynda Miktuk. She shared her learner's journey and continues to help educators grow while working with Erie 1 BOCES in Western New York. From the U.S. Army, to the medical field, to education, Darlynda's quest is special. She has inspired many along the way and continues to find new ways to reach and impact teachers and administrators. Connect with Darlynda on Twitter @DarlyndaMiktuk. In this quest, we are live from #CoffeeEduRoc at Stir Coffee in Irondequoit, NY post-EdCamp Rochester. Hear from Hilton CSD educators Jason Cring (@iliketech) and Mike Szczepanik (@mikeszczepanik), Gates Chili CSD educator Bill Brown (eyes_of_ibad), and Genesee Valley Educational Partnership Instructional Coach Connie Rockow (@crockow8). They share the origin of Coffee Edu (a one-hour unconference) in their region, how to get started, what they love about it and how it contributes to their why in education. On this quest, Michael Drezek meets with Bryan Gorman and Arvind Agarwal of Buncee to discuss creativity in the classroom and how educational technology companies are working with students and educators to help create learning experiences that keep them asking for more! After a day touring Lake Shore CSD classrooms, Bryan and Arvind had a chance to see their product in action. It was a great experience for all involved and this conversation is just one example of why Buncee is winning over classrooms around the world. Check out https://app.edu.buncee.com/ to learn more. On this quest, live from #TIFcon18, we talk to Michelle Krieger, Educator Innovator for Holland CSD. She shares her experience creating holograms using everyday supplies. She had no experience to start and now has ideas of how this can apply to math classrooms, studying historical characters and beyond. Find notes and examples from #TIFcon18 session participants here: https://goo.gl/S2ja8Q. Follow Michelle @hollandtechgirl on Twitter. On this quest we'll talk to students from South Davis Elementary in Orchard Park CSD about their experience leading and learning in a student edcamp. Is this just a trend or might they be here to stay? The Quest for Edlightenment team will discuss how making time for student voice and choice made for a memorable experience for all involved. Meet two groups of student problem finders and problem solvers. In this episode, we will talk to two student app inventor teams from the Canada Connect Conference competing in the student technovation challenge. Country Coders created the app Don't Bug Me and Lady Leopards Tech created the app Stress Less. Get inspired by these amazing students, hear their journey and how they are learning and making the world a better place. Meet hosts Michael Drezek, Mark Drollinger, and Brian Sepe. When similar interests and goals for education and learning align, this podcast shifted from a single voice to a collection of voices. In this episode we'll discuss our why, and our what's next. We hope you will continue to join us and even bring a friend or two to future episodes. Enjoy what's in store on this Quest for Edlightenment. Learn about virtual worlds with Western New York educator, Andrew Wheelock. Andrew is currently the PLN Leader for the ISTE Virtual Environments Network. Hear how classrooms are using this technology in multiple content areas. 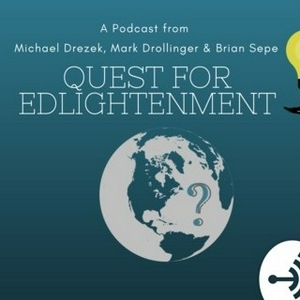 Welcome to the pilot episode of Quest For Edlightenment. Thank you for joining me on this podcasting journey. I look forward to learning and connecting with you here!